3810 N. Croatan Highway Suite K.
Children at Play Inc. provides an environment developing young children’s levels of physical fitness, health, and creativity through hands-on learning activities that stimulate children’s intellectual growth. Children at Play Inc. is an inviting facility where children learn, play and explore while cooperating with other children. The museum offers many hands-on exhibits that encourage children to use their imaginations and explore new concepts about science, math and language arts. The museum facilitates positive feelings about being physically fit and staying active. Children at Play Inc. is affordable and accessible to everyone in the community. Children with all abilities and disabilities are welcome at the museum and are able to integrate with their peers. Children at Play Inc. is a place where teenagers, who may be interested in working with young children in the future, can come and volunteer time. Children at Play strives to be green and environmentally conscious. We use recycled and renewable products when possible and conserve on energy and waste by recycling, reducing, and reusing. 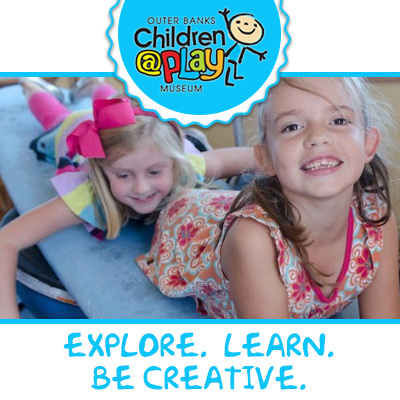 Children at Play promotes and supports local businesses and craftsmen in the Outer Banks when possible.